I don't think I was able to do such a long and epic story like Devlin Waugh: Red Tide justice in my Meg Reviews simply because I didn't like it that much. So I have asked Greg Meldrum, fellow 2000 AD Forum member and comic blogger, to walk you through his view. Hopefully it will help you determine whether this story is worthy of your attention. Your host, the lovely Mr. B, wasn’t too taken with ‘Devlin Waugh: Red Tide.’ It seems the camp vamp’s stock-in-trade combo of bon mots and Kem-Kwong killing techniques just didn’t tick the requisite boxes. As someone who views the series more fondly, I’ve been asked to provide my thoughts as a counterpoint to his. I’ll be blunt. ‘Red Tide’ isn’t the best Waugh story, nor the best John Smith script out there. Not even close. Its flaws are fairly apparent. It drags a bit, it gets a little repetitive, and it lacks the out-there poetry that the best of Smith’s work conveys. It is, in short, a fairly straight-forward action story with some weird trimmings, rather than a warped-to-its-core weird story with some action trimmings, such as ‘Rogue Trooper: Cinnibar’ (in many respects, the anti-‘Red Tide’.) It’s arguable that this was true of ‘Swimming in Blood’ as well, but that story had the advantage of real freshness. The juxtaposition of Waugh’s hilarious self-pitying dialogue with the creeping horror of the fast-spreading vampire plague was a winning and unique combination – it was almost as if Waugh had gate-crashed the story and seemed to be operating by an entirely separate set of rules. Here though, we’re rather more used to his now-familiar schtick, and the formula of ‘hack up the undead, use an inappropriate epithet in the process’ doesn’t have quite the same punch. 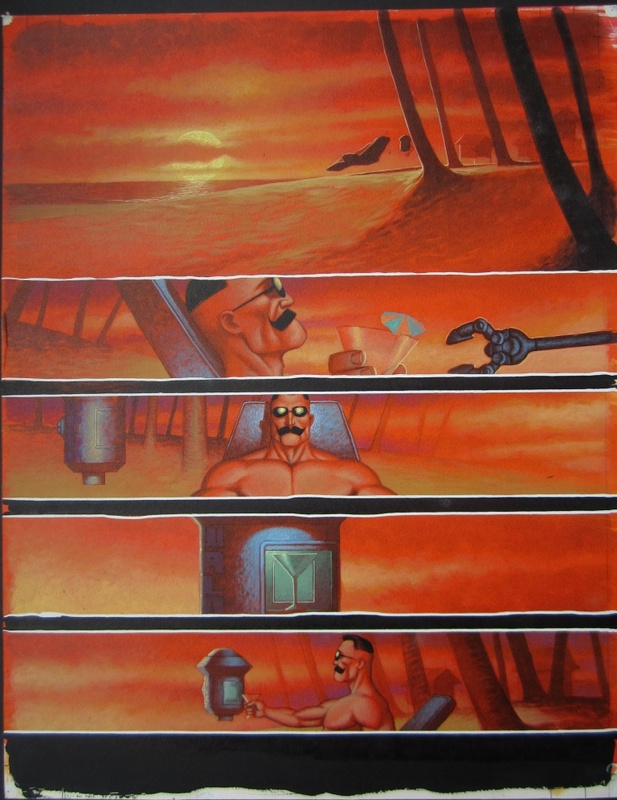 However, the thing that’s most clearly missing is John Smith’s utterly unique narrative voice – the fey, febrile, frequently sinister caption boxes that help make ‘Revere’, ‘Firekind’ and indeed ‘Swimming in Blood’ such visionary pieces. Was this Smith’s idea or editorial’s? I do wonder if it’s the latter – there seemed at times to be a concerted effort to make Smith’s writing more ‘disciplined’ (David Bishop’s word) or to make it adhere a little more closely to conventional story-telling methods. A mistake, in my view. But that said, Smith on a fair-to-middling day is still better than most writers on a good one, and as such, I really enjoyed my re-read of ‘Red Tide’ – much more, in fact, than I thought I was going to. The flashes of Smithian genius may be less widespread, less all-encompassing and disorientating, but they are present nonetheless. By far and away the strongest elements of the story are Smith’s fascinating ideas on how vampires might adapt to an aquatic lifestyle. This aspect of the story is original and brilliant, and all the talk of bioluminescent photophores, poison quills and toxic algae-grazing sounds both outré and yet scientifically sound. We are even given tantalising glimpses of particularly well-adapted specimens: the mudskipper mutants and the deep-sea berserkers, the latter exploding if they rise to the surface too quickly. This is what I want – monstrous ecology! Frankly, I can’t think of anything more exciting to fill the pages of any comic strip. More of this and less of Lilith the Daywalker (a bit too much the writer’s pet) would have made the strip into a classic of the first water. Another element that works well, and helps to build tension, is the way in which Smith exploits the change in Devlin’s status since ‘Swimming in Blood’. For most of that story, Waugh was a mortal – now that he’s undead, many methods for dealing with vampires cause him just as much harm as his foes. Furthermore, much of the dialogue remains quintessentially Smith – not so much Devlin’s witticisms, more the language Smith uses to describe and name not only technology, but also psychic talents and aspects of vampiric heritage. Smith has always excelled at crafting evocative turns of phrase that suggest a wider world than he is able to cram into any given strip, and he does that once more here. Bloodsires and coilguns and psi-spoor – oh, my! He has a way with words, our Smiffy, hinting as he does, with Lovecraftian skill, at eerie immortal vistas of eternal blood-lust. And speaking of blood – where would this series be without Colin MacNeil? 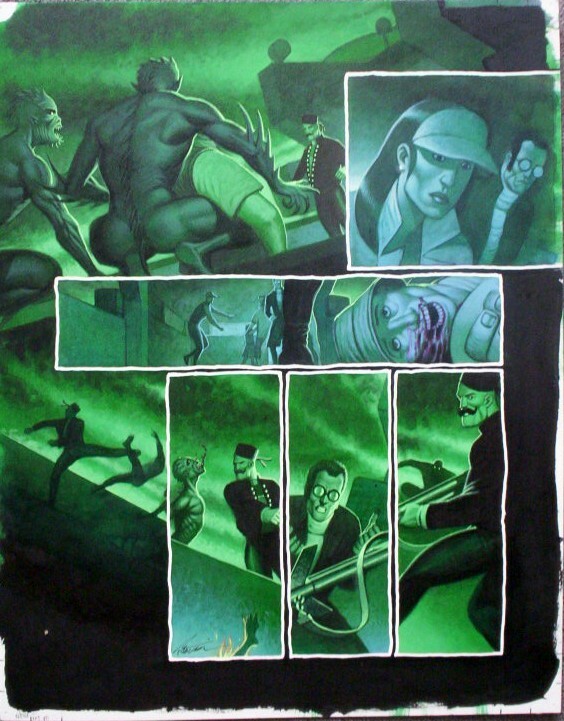 The venerable artist claimed to be consciously channelling Tom of Finland when depicting Devlin’s muscle-bound exploits, and he turns in a ripping performance to be sure, his lurid colours adding significantly to the ambience – just a shame the whole thing got printed a bit too dark when they collected it for the trade. MacNeil’s always a good go-to man when it comes to a bit of graphic blood-letting (he seems like such a lovely chap, too!) and the script certainly gives him plenty of opportunities to indulge. Overall, then, ‘Red Tide’ is a solid rather than spectacular outing for Devlin, but I do find myself appreciating it much more now than I did at the time – as has been rightly observed, it really should have run weekly rather than monthly. Nonetheless, it is quite important in Waugh continuity, as much for what happens on the last page as anything else, and, though the latter half of the story loses momentum somewhat, Smith and MacNeil ensure it never runs aground. Fangs for that, chaps. And fangs to Simeon too for giving me the impetus to delve back into the story’s entrails – there’s more in here than I thought!